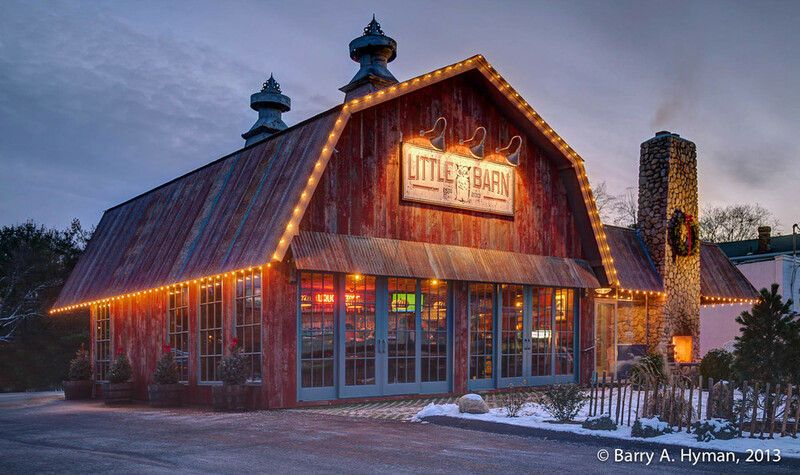 Barry A. Hyman shares a cozy winter scene of the brand new “Little Barn”. Formerly Swanky Franks for years and before that a Dairy Queen, this casual pub recently opened its doors at 1050 Post Road East in Westport, CT. The interior is wrapped in reclaimed red barn siding, with a warm and cozy inviting two-sided stone fireplace. For the summer months there are big sliding doors that open to an outside patio. Vintage black-and-white photos adorn the walls, and a hostess station is fashioned from an old tractor grill.